Women and children carrying jerrycans filled with water on their backs-Melbana Village-Oromia Region. UNICEF Ethiopia/Flickr. 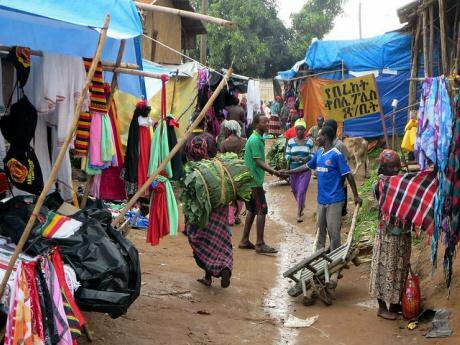 Some rights reserved.A shadow of fear and panic is creeping through villages in north-eastern, central and southern Ethiopia, where once again famine stalks the land. The seasonal rains that usually fall between June and September did not arrive, and now, with the ‘dry season’ here, the already severe situation can only deteriorate. 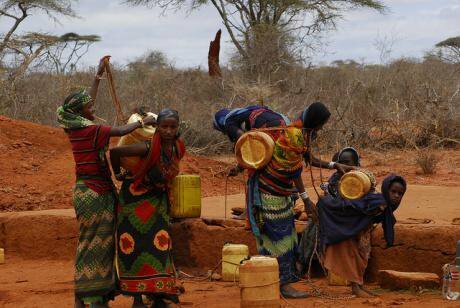 According to the UN, Ethiopia “is experiencing its worst drought in 30 years”. In some areas, the poorest, most vulnerable infants are already dying at a rate of two per day. Around “350,000 children are in need of treatment for severe acute malnutrition,” UNICEF declares, and up to 8.2 million people (out of a population of 95 million) urgently require relief assistance. This number is expected to rise to a staggering 15 million by early 2016. Ethiopia is experiencing its worst drought in 30 years. A villager near Wallo in the north of the country told the BBC, “although this drought has just started, it's going to get worse…It’s already really severe. Some people have died of hunger, others are sick in their beds – right now it's just like 1984." In that year alone, almost half a million people starved to death. The drought is caused by the El Nino weather system, and has resulted in a 90 percent reduction in crop yields; the famine, though, is brought about by various factors, some of which are the result of poor governance and state neglect. El Nino is characterised by warming sea-surface temperatures in the Pacific Ocean, causing “extremes such as scorching weather in some regions of the globe and heavy rains and flooding in others,” Reuters reports. Scientists say it has been with us for millennia, but is intensifying and becoming more frequent due to global climate change; last year’s phenomenon is said to be one of the worst on record. 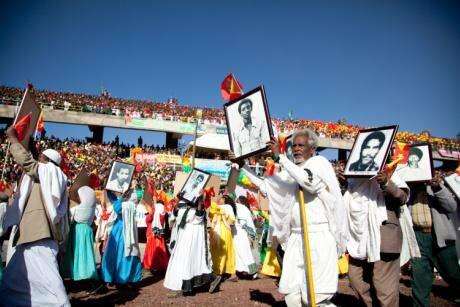 Ethiopia's TPLF ruling party celebrates 40th anniversary. Gwendolyn Meyer/Demotix. All rights reserved.The UN Office for the Coordination of Humanitarian Affairs says that the Ethiopian People's Revolutionary Democratic Front (EPRDF) government has “earmarked $192 [£127] million for emergency food and other assistance, diverting money from projects such as road construction,” and the Integrated Regional Information Network news agency (IRIN) says that $163 million has been pledged by the ‘international community’. This is to be welcomed, but it’s nowhere near enough – according to aid agencies $600 million is needed. The amount set aside by the EPRDF is inadequate and there is growing anger at the way food aid is being distributed, with some people inside the country and within the diaspora making allegations of state corruption. Ethiopian Satellite News (ESAT) spoke to a farmer from Raya Qobo in Afar who claims that “government officials tell us that aid is coming soon; however no aid has so far been delivered and we are pondering to migrate to towns.” The ruling regime “has gone to the extent of kidnapping people who enquire about the food aid even at this critical time.” Consumed with vain ideals of regional status and a distorted national image, the ruling party lacks the political will to deal with this openly. Partisan food distribution is consistent with the manner in which all humanitarian support, as well as employment opportunities, homes, medicine and university places are given. Those who openly oppose the EPRDF receive little or nothing – small-holder farmers are denied fertiliser; families refused food; students forbidden university places; men and women not allowed to work. Not only are people on the verge of starvation, farmers, whose crops have failed due to the lack of rainfall, are being hounded by government thugs for loan repayments (taken to buy fertiliser that in all likelihood should have been given as aid) they cannot now make. ESAT news reports that, “local government officials jail farmers who could not pay their loans”. Consumed with vain ideals of regional status, economic development (despite some growth, the country ranks as the third poorest in the world) and a distorted national image, the ruling party – a brutal dictatorship, despite democratic pretensions – lacks the political will and compassionate honesty to deal with the situation openly. They have stopped people in Addis Ababa and elsewhere collecting funds for famine victims, and, consistent with past denials, the deputy prime minister, Demeke Mekonen, commenting on a BBC programme discussing the crisis, is reported to have told a local journalist that “there is no such thing as famine in Ethiopia these days”. The BBC news coverage was also condemned by the Ethiopian Embassy in London, which contradicted the UN’s information, that children are dying from malnutrition in drought-affected areas, and said the BBC report was "sensational". The government’s propaganda is most commonly churned out by communications minister Getachew Reda, who, according to IRIN, has stated that, “there is no one that we know of that has lost their life as a result of the drought-induced crisis”. Tell that to Bertukan Ali, whose five-year old son died “when the family ran out of food because the rains did not come,” the BBC says. Irrespective of the era or the rulers, duplicity is, it seems, a characteristic of the state. Such dishonesty is reminiscent of 2012, when prime minister Meles Zenawi died, and the government kept it hidden for months; or when thousands were dying of starvation in 1973 but Emperor Haile Selassie denied there was famine in the country, or in 1984 when the military ruler Mengistu Haile Mariam attempted to conceal starving millions from the world. Irrespective of the era or the rulers, duplicity is, it seems, a characteristic of the state; so too is regime apathy, neglect and corruption. The EPRDF will no doubt continue to try to control and manipulate the media coverage of the crisis – local, national and international; allowing only restricted access to affected areas of the country, and silencing aid organisations in an attempt to lessen the ‘political’ impact of what they see as negative images of the country. Stark images of parched land; dried-up wells and dead cattle; malnourished children crying with hunger, and desperate, anxious men and women waiting for food aid, praying for help and support. Ethiopia, 1984-85: GOAL aid worker, Maura Lennon outside a feeding centre in the Northern Shewa region. GOAL Ireland/Flickr. Some rights reserved.Ethiopia has been plagued by famine going back to the sixteenth century. In recent times it struck the country in 1973 (40,000 starved in the north-east and around 55,000 died in the Ogaden region), and, most notoriously between 1983 and 1985, when areas of northern Ethiopia and Eritrea were affected in what is regarded as the worst famine to hit the country in a century. Although the UN estimates that one million people died in the ‘Great Famine’ (1983 to 1985), scholar Alex De Waal states that the number of fatalities ranged from 400,000 to 500,000. Millions of others were made destitute, lives shattered. Climatic conditions resulting in drought are widely blamed. But many believe the famine was caused, in large part, by government policies. The Mengistu government bombed market places, which stopped 'rural trade and exchange'. The Mengistu government bombed market places, which stopped 'rural trade and exchange', hindering the redistribution of surplus foods. Other government-made causes of the famine were the “punitively high delivery quotas of staple grains to the Agricultural Marketing Corporation and heavy taxation,” plus the fact that the majority of food relief was channelled through the “government side”. This despite them only having access to a minority of the “famine stricken population” in the north. De Waal estimates that over half of the 400,000 who died in the famine can be attributed to “human rights abuses causing the famine to come earlier and strike harder, and extend further than would otherwise have been the case.” Human rights abuses that are just as acute, if not more so, under the present regime, and are perhaps even more widespread. The streets double as drainage canals at Jinka, Southern Ethiopia. David Stanley/Flickr. Some rights reserved.Although the Ethiopian government has made some provision to mitigate the impact of poor harvests, such as establishing a sort of social security net so poorer farmers can access funds for public works such as digging water holes, many have been critical of the EPRDF’s response, and their inability to foresee and plan for the current crisis. Given the country’s exposure to drought, as well as the intensifying, ongoing threat caused by climate change and El Nino weather patterns, long term plans need to be put in place to mitigate the effects. The answer to famine is not increased levels of food aid, but strategic planning to enable communities to survive the impact of extreme weather, made more acute by climate change. As Thabani Maphosa, World Vision's Vice President of Food Assistance Programmes, states, “food assistance interventions must be designed to empower poor people to build productive assets such as water harvesting tanks, dams and irrigation projects,” as well as strengthening and consolidating small holder-farming – not allowing foreign companies to build industrial-sized farms and grow crops for export only (which continues apace in Ethiopia) – in order to help them become self-sufficient in the long term. The answer to famine is not increased levels of food aid, but strategic planning. The first duty of any government is the safety and wellbeing of its citizens: to this end much more should and could have been done to safeguard the people of Ethiopia against the risk of low yields and resulting food poverty. But the priorities of the ruling regime are not (and they consistently prove this) the security, freedom and happiness of the population, but control – often violent, holding onto power and the accumulation of personal wealth. Donor countries also have a long-term responsibility to the people they purport to support; to this end the governments of Britain, America and the European Union (who collectively give over half of Ethiopia’s annual federal budget in various aid packages) must ensure that the Ethiopian government, whoever it may be, put in place visionary plans to mitigate the impact of any future drought, which, with climate change a fact for us all, will undoubtedly take place.